2009 Boat of the Year contest. For many years, the under-30-foot range was a completely forgotten niche in the new-boat marketplace, which makes the debut of the new, trailerable Andrews 28 all the more welcome. 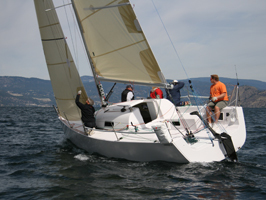 Designed by Alan Andrews, the Southern California naval architect renowned for his light, fast, innovative raceboats, this 28-footer will certainly appeal to those cruisers who also enjoy a little club racing. But with its open and airy belowdecks layout—V-berth forward; double aft; a pair of cozy amidships settees; and a workmanlike galley, head, and nav area, not to mention a 10 -horsepower diesel auxiliary—it'll also do more than adequate double duty as a peppy and versatile coastal cruiser. Built in Canada by Sylvana Yachts, the Andrews 28 is built as a vacuum-infused composite sandwich utilizing vinylester and epoxy resin and PVC closed-cell foam. Nearly a third of its all-up weight is dedicated to the ballast bulb at the business end of its retractable keel. The boat can be ramp launched behind a light truck or SUV; the keel-up draft of just 2 feet adds to its versatility as a thin-water gunkholer. Where the Andrews 28 really makes hay, however, is under sail, as we learned in challenging winds between 5 to 8 knots on Chesapeake Bay. With its handy coarse-and-fine mainsheet options, backstay adjuster, and traveler, along with the adjustable headsail sheet leads and in-haulers, the 28 is an eminently tweakable boat. Upwind, in just 6 knots of true wind, we saw speeds of 5.6 to 6.2 knots. On a close reach with the asymmetric flying (set off a dedicated sprit), we upped the ante to 6.6 to 6.8 knots. 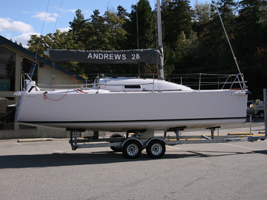 For many cruisers, truthfully, the Andrews 28 will be a bit too sprightly. For those with a sporty bent, however, the aim is obvious: Sheet in and go. ... Bill Springer takes a brief look at the Andrews 28, which is billed as a sport/cruiser before the Annapolis Boat Show. 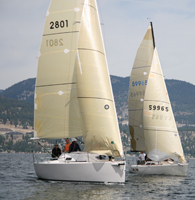 The Andrews 28 is billed as a sport/cruiser. So, that probably means the design brief called for a hull to be light and stiff, the rig to provide plenty of sail area ponies and a retractable bowsprit to help off wind drag racing, the keel to have a narrow chord and a heavy bulb, while also providing "cruiser friendly" accommodations. And by the looks of it, the Andrews 28 pays attention to all those areas. Another key feature is the retractable keel that should ease trailer ramp woes. Preliminary info also reports that the keel box has a positive lock to keep the keel securely in the down position, and that keel grounding forces are distributed in the hulls structural frame on impact. Interesting. It looks quick and is scheduled to be at the Annapolis Boat Show, so I'll have more hard data in the a couple weeks. Here's a new fast looking racer-cruiser from one of my favorite designers, Alan Andrews, who has his office in Long Beach, California. Over the years I think all of Alan's boats have been excellent performers and I don't see why this little dual-purpose design should be any different. “Dual purpose” might be a bit confusing. Is it a racer or is it a cruiser? 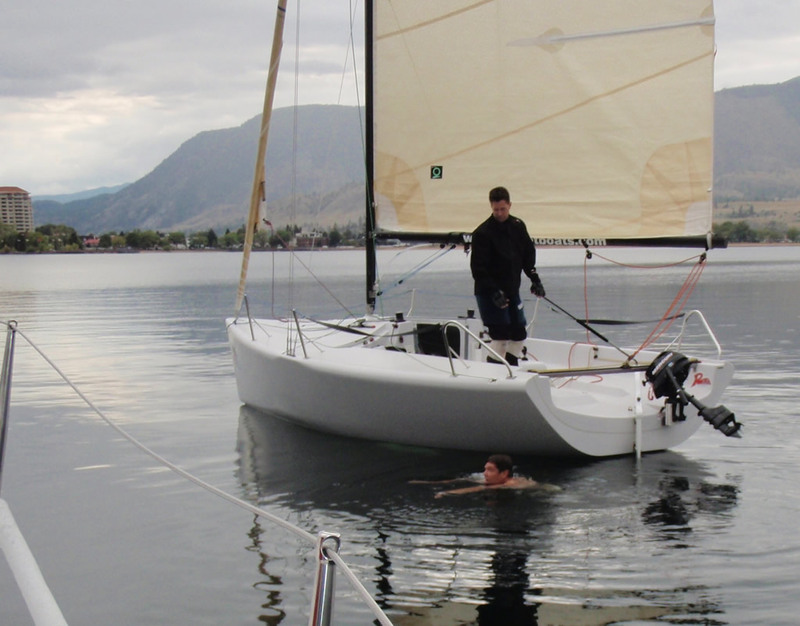 I spoke to the builder, Ivan Ivandic of Sylvana Yachts Inc. up in Penticton, British Columbia, the heart of Canada's wine region, and he said the boat is a “sport cruiser.” That's a new category for me but I like it. This boat combines the performance of a sport boat with the comfort of a family cruising boat. It would be hard to ask for more out of one boat. The D/L for this design is 98.05 and the L/B is 2.82. So we can call this a light and beamy boat. I don't have any hull lines but looking at the pictures of the boat I don't see any hollow in the entry. The turn to the bilge looks firm and the stern is broad. The boat has high freeboard and this gives it a bit of a stubby look. That is a compromise with the cruising interior. Low freeboard is fast but does not make for a boat with any headroom. 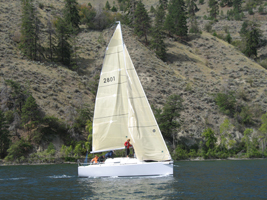 The deep fin keel is retractable for trailering. When retracted, there are still about 24 inches of keel protruding but this fits easily on a trailer and the boat can be ramp launched. 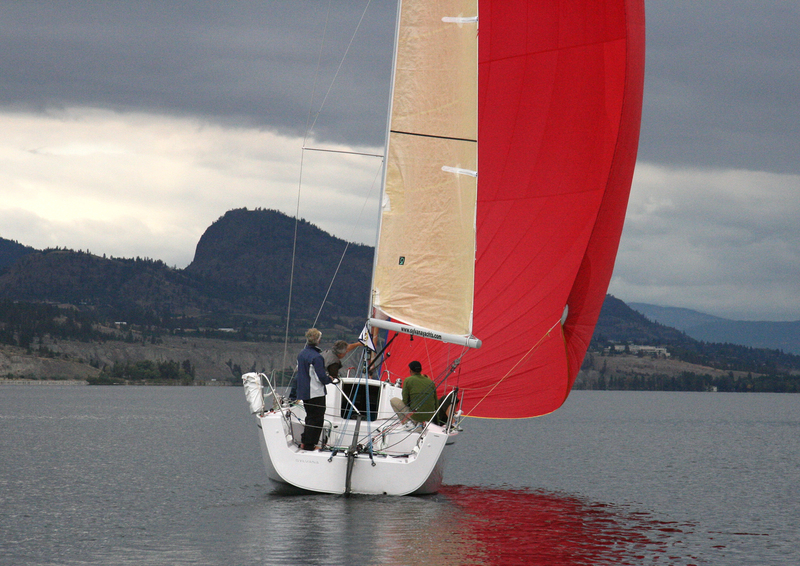 Draft is 7 feet with the keel down and 2 feet, 5 inches with it retracted. The carbon fiber rudder blade slides into an outboard carbon fiber cassette so that it can be easily removed or retracted for trailering. Note how far forward on the keel fin the bulb is positioned. In most cruising boats you struggle to get the keel fin aft while keeping the center of gravity of the ballast forward. With a T-configuration fin and bulb this is easily accomplished. 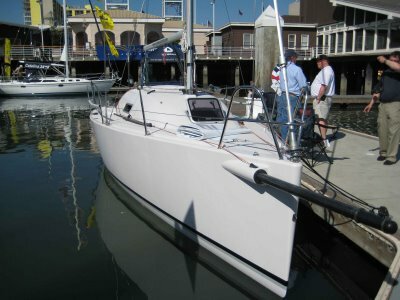 The 28 is laid out with a double quarterberth aft and V-berth forward. There are settees amidships but they look too short to be to be used as berths. There is a head aft to starboard and a galley to port. The keel trunk extends up under the drop-leaf dining table. There is a nav station directly forward of the head. The finish of this interior is all white and clean looking. If you prefer the look of wood veneers and trim I suspect you will find this interior a little too cold and clinical looking. All interior panels including the cabin sole are cored. The rig features a deck-stepped carbon fiber mast for ease in trailering. The SA/D is 28.17 so this boat has plenty of sail area for good light-air speed. The double spreaders are swept 22 degrees. A retractable sprit allows a huge masthead chute to be carried. The cockpit is quite roomy. There are seat backs forward and the helmsman sits on the deck aft. The mainsheet traveler is on the cockpit sole immediately ahead of the helmsman. The tiller is carbon fiber. This will be a boat that is easy to own. For me the size is near perfect. There is no wood on deck so a bucket and a brush is all you will need to keep it shining. The engine is a sail drive, 10-horsepower Yanmar 1GM10 under the companion way. We went up to the Great White North last weekend to sail the new Andrews 28, check out the factory and do a little vistin' with the locals. First off to the Sylvana Yachts factory (they also build and sell the Rocket 22' s as well) where owners Vladimir & Ivan Ivandic has clearly spent some money not only buying a decent sized building, but also obviously put a lot of effort into building really nice tooling and molds for the boat. If you've seen the finished boat (and damn few have), you have seen how nicely finished it is. They build almost everything for the boat right there, including pouring the lead for the bulb . It all looks good, but here's the problem: they have sold just one of them! No doubt there are a number of factors that are contributing, a really bad economy, a spendy 28' and the fact that nobody knows much about the boat. Hull #1 did appear at The Strictly Sail Pacific show last April and it showed well, but while a lot of people liked it, it didn't translate into orders. The thing must go pretty well (although when I raced it Sunday, there was about 3 knots of wind so it was hard to tell) as Alan Andrews got the thing a bunch of bullets at Whidbey Island Race Week, and it has the most interior volume I've seen for a R/C boat this size - real actual room (including an enclosed aft head) that would make overnighting actually doable. One of the all time classic kid comments was made by my 9 year old son when we were sitting down below the boat at the April show. While Andrews and I were chatting, my kid was laying in the forepeak reading his book when he looked up and said, "Hey daddy, how come our boat doesn't have a couch like this?" Point well taken. So it has to come down to either people don't know about the boat or a $100k 28' just won't sell. 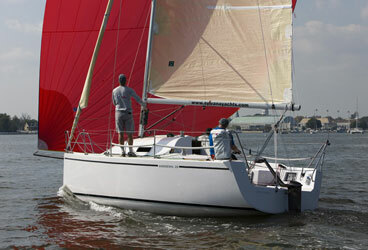 The boat will be at the Annapolis Boat Show next month, so there should plenty of people to see it. Plus we are running an ad here at SA. My opinion is that the boat has most of the right stuff - a known designer, decent looks, good build, good performance, but it also has too much - namely price and an inboard. With so many boats like the Flying Tiger having mid mounted outboard wells, it is such a less expensive and complicated way to handle auxiliary power that it really seems a better answer. They should have done that from the start and it would have not only made the boat faster, it would have been $20k less, perhaps a big price point difference. Either way, if you go to Annapolis, find the 28 somewhere in the water and see what you think. We like it and would be surprised if most don't as well. It's 3am and while most sailors are snug in their bunks for the night, yacht designer Alan Andrews is up and on his way to LAX in order to board a flight for the Sea-Tac airport. In just a few hours Alan will be jumping onboard his newly designed Andrews 28 and taking in a few days at the crown jewel of Northwest Racing; the vaunted 26th annual Whidbey Island Race Week. Under new management this year with well known local Melges 24 racer, Lidgard sails rep and fellow ‘anarchist'(jibeset) Gary Stuntz taking over; the race week has again grown to over 120 boats and marks Alan Andrews first visit to the cherished Penn Cove proving grounds. As a veteran of many Race Weeks and other world famous races we took the opportunity to sit down with Alan briefly to get his thoughts on racing Whidbey for the first time…. And what about the fleets we asked? What were your thoughts on the boats in the NW? “Great to see the strong one-design fleets with the Moore 24's out there, also the 105's, & Melges 24's, but also very encouraging to see some healthy handicap racing” was Alan's response. “You really notice the overall size of the boats are very suited to racing in Penn Cove. Big boats would be tough to tack efficiently up the shoreline. There are lots of smaller boats involved and that is really refreshing. With smaller boats, there are more boats for the same number of sailors at the regatta and that means more skippers, tacticians and people intensely involved with the racing instead of just riding the rail,” said Andrews. “Seeing some of the older one and two tonners definitely brought back memories; a few of these boats originally hailed from California when I was a kid,” remarked Andrews. Naturally we also had to ask Alan's thoughts on his new Andrews 28 design that he sailed on for the last two days “It went great, it was really fun to sail, fast and the accommodations seemed to be really well received by everyone, Amazing to be winning on the race course and then an hour later relaxing below decks with 5 people without feeling crowded. I really enjoyed the boat,” summed up Andrews. 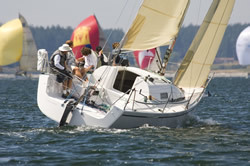 And not long after hitting the dock on Friday Alan was headed back off to the Sea-Tac airport in order to return home to compete in the Balboa Yacht Club's annual Club Championships the very next morning. Such is the life of a busy and talented Yacht designer and sailor. Also on the drawing board for Alan is a new Class 40, a 45 foot cruising catamaran, initial work on a 70 foot racer, and a few commercial projects as well. Somewhere in between likely a few more hours of sleep as well. Our thanks to Alan for offering up some thoughts on racing at Whidbey. We would also like to thank photographer Todd Martin from Photo's By Todd for the photo. To see more of Todd's great work at the Whidbey Island Race Week please visit Todd's outstanding website . -Rudy Enzman. Sylvana Yachts is proud to introduce the new Andrews 28 Sport Cruiser; a fully trailerable; cruisable, and raceable 28' performance yacht fresh off the drawing boards of noted designed; Alan Andrews. The past decade has been an exciting one for the sport of sailing; boats have become faster, lighter, stronger and most important they have become easier to sail. However lost in this evolution has been comfort. There was once a time when boats were equally as at home on the race course as they were on the cruising grounds. When the delivery was as much fun as the event itself. When sailing with family and friends were always part of the adventure. Many of us grew up on boats like that. The Andrews 28 represents a return to days gone by. A boat that offers near sportboat performance; and at the same time all of the comfort and convenience features one would expect to cruise your favorite destination. At the same time being fully trailerable the Andrews 28 can open up the possibility of new cruising areas; never before attempted races; and an alternative to boat ownership in regions with limited moorage availability. 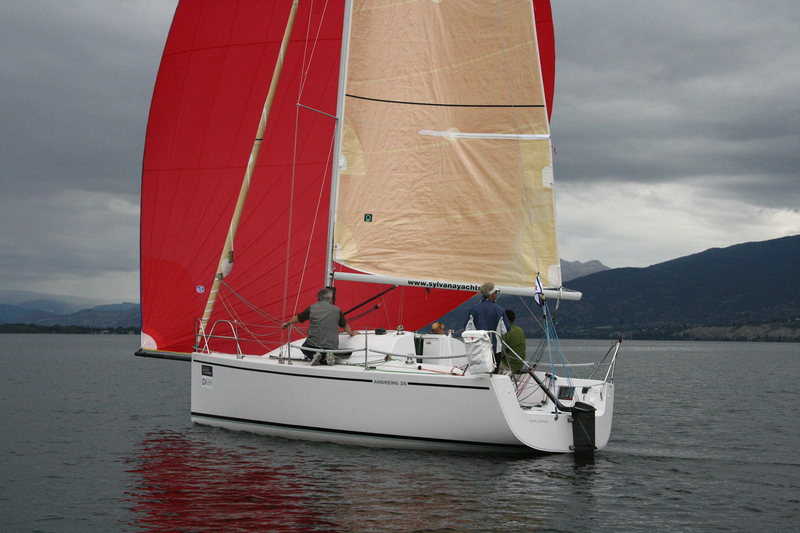 The Andrews 28 was truly developed and conceived to meet the needs of the active sailor. To build a boat of this nature requires cutting edge design technology; the best quality infused vinylester resins; premium foam cores that will never rot and carefully engineered construction. 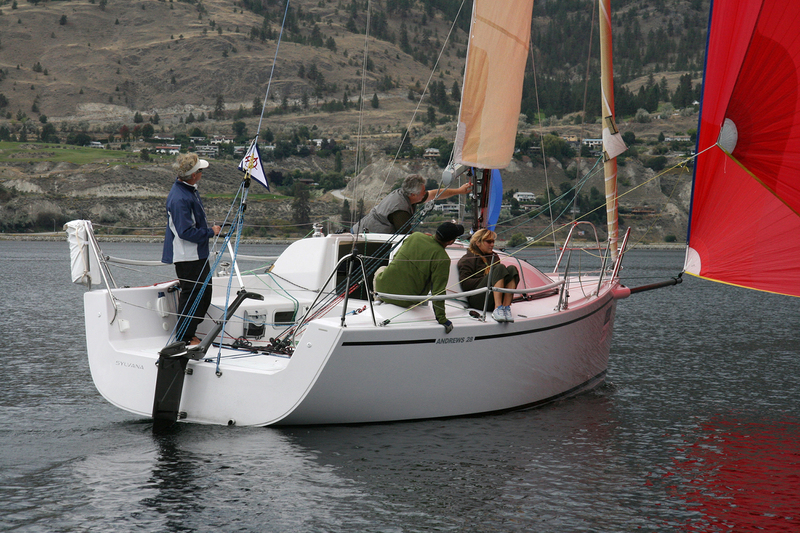 The Andrews 28 is a limited production; hand made vessel built to the highest possible standards. The Andrews 28 base boat equipped with a Yanmar diesel saildrive engine and carbon spars run at $ 97,000 CDN.